This article is about the fish species. For other uses, see Goldfish (disambiguation). The goldfish (Carassius auratus) is a freshwater fish in the family Cyprinidae of order Cypriniformes. It is one of the most commonly kept aquarium fish. A relatively small member of the carp family (which also includes the Prussian carp and the crucian carp), the goldfish is native to East Asia. It was first selectively bred in Ancient China more than a thousand years ago, and several distinct breeds have since been developed. Goldfish breeds vary greatly in size, body shape, fin configuration and colouration (various combinations of white, yellow, orange, red, brown, and black are known). Goldfish have one of the most studied senses of hearing in fish. They have two otoliths, permitting the detection of sound particle motion, and Weberian ossicles connecting the swimbladder to the otoliths, facilitating the detection of sound pressure. Breeding goldfish by the hobbyist is the process of selecting adult fish to reproduce, allowing them to reproduce and then raising the resulting offspring while continually removing fish that do not approach the desired pedigree. Common goldfish come in a variety of colours including red, orange, "gold", white, black, and yellow ('lemon') goldfish. The Black telescope is a black-colored variant of telescope goldfish that has a characteristic pair of protruding eyes. It is also referred to as popeye, moor, kuro-demekin in Japan and dragon-eye in China. The small, fancy Bubble Eye has no dorsal fin and upward pointing eyes accompanied by two large fluid-filled sacs. Fancy Celestial eye goldfish or Choten gan has a double tail and a breed-defining pair of upturned, telescope eyes with pupils gazing skyward. The comet or comet-tailed goldfish is the most common single tailed variety in the United States. It is similar to the common goldfish, except slightly smaller and slimmer, and is mainly distinguished by its long, deeply forked tail. The Fantail goldfish is the western form of the Ryukin and possesses an egg-shaped body, a high dorsal fin, a long quadruple caudal fin, and no shoulder hump. The fancy lionhead has a hood. This fish is the precursor to the ranchu. The fancy oranda is characterised by a prominent raspberry-like hood (also known as wen or headgrowth) that encases the whole head and some with the entire face except for the eyes and mouth. The fancy pearlscale or chinshurin in Japanese, is spherical-bodied with finnage similar to the fantail and veiltail. Its scales are protruded into white domes that remind us of pearls. The fancy Pompoms or pompon or hanafusa have bundles of loose fleshy outgrowths between the nostril ,called nasal boquettes, on each side of the head. The ryukin has a short, deep body with a characteristic shoulder hump. Fancy and hardy Japanese Shubunkins (朱文金) (translated literally as "red brocade") have a single tail with nacreous scales, and a pattern known as calico. The fancy telescope is characterised by its protruding eyes. It is also known as globe eye or dragon eye goldfish. The fancy Japanese ranchu is hooded. The Japanese refer to it as the "king of goldfish". The fancy panda telescope is another colored variant of telescope goldfish. The fancy veiltail is known for its extra-long, flowing double tail. Modern veiltail standards require little or no indentation of the trailing edges of the caudal fins, as in a wedding veil for a bride. The Butterfly Tail Moor or Butterfly Telescope is of the telescope-eye lineage, with twin broad tails best viewed from above. The spread of the caudal fins resembles butterflies underwater. The Meteor goldfish is a strange-looking variety that has been developed by specialist breeders of fancy goldfish. It has no tail fin, hence its name. The Lionchu or lionhead-ranchu is a fancy goldfish that has resulted from crossbreeding lionheads and ranchus. The egg-fish goldfish is a fancy goldfish that lacks a dorsal fin and has a pronounced egg-shaped body. The Shukin is Ranchu-like goldfish developed from Ranchu and Oranda at the end of the 19th century in Japan. The Curled-gill or Reversed-gill goldfish is another uncommon variety of fancy goldfish that has been developed by specialist enthusiasts. It owes its name to the out-turned appearance of its gill covers. The Tamasaba or Sabao is an uncommon Japanese variety of goldfish with a body shaped similar to the Ryukin and a very long, flowing, single tail that is similar to that of a comet goldfish, hence its other name, comet Tail ryukin. The Tosakin is a very distinctive breed of goldfish with a large tail fin that spreads out horizontally (like a fan) behind the fish, followed by the bottom tips folding behind its caudal fin. Though technically a divided tail, the two halves are attached at the center/middle forming a single fin. The White telescope is a white variant of telescope goldfish that has a white body and characteristic pair of protruding eyes. Chinese tradition classifies goldfish into four main types. These classifications are not commonly used in the West. Crucian (may also be called "grass")—Goldfish without fancy anatomical features. These include the common goldfish, comet goldfish and Shubunkin. An orange coloured wild-caught Prussian carp with goldfish-like colouration. Prussian carp remain the closest wild relative of the goldfish. Previously, some sources claimed the Crucian carp (Carassius carassius) as the wild version of the goldfish. However, they are differentiated by several characteristics. C. auratus have a more pointed snout while the snout of a C. carassius is well rounded. C. a. gibelio often has a grey/greenish colour, while crucian carp are always golden bronze. Juvenile crucian carp have a black spot on the base of the tail which disappears with age. In C. auratus this tail spot is never present. C. auratus have fewer than 31 scales along the lateral line while crucian carp have 33 scales or more. Like their wild ancestors, common and comet goldfish as well as Shubunkin can survive, and even thrive, in any climate that can support a pond, whereas fancy goldfish are unlikely to survive in the wild as their bright colours and long fins make them easy prey. Goldfish can hybridise with certain other species of carp as well as C. a. gibelio. Within three breeding generations, the vast majority of the hybrid spawn revert to the wild type colour. Koi may also interbreed with the goldfish to produce sterile hybrids. Like most species in the carp family, goldfish produce a large amount of waste both in their faeces and through their gills, releasing harmful chemicals into the water. 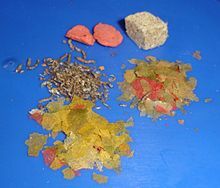 Build-up of this waste to toxic levels can occur in a relatively short period of time, and can easily cause a goldfish's death. For common and comet varieties, each goldfish should have about 20 US gallons (76 l; 17 imp gal) of water. Fancy goldfish (which are smaller) should have about 10 US gallons (38 l; 8.3 imp gal) per goldfish. The water surface area determines how much oxygen diffuses and dissolves into the water. A general rule is have 1 square foot (0.093 m2). Active aeration by way of a water pump, filter or fountain effectively increases the surface area. The goldfish is classified as a coldwater fish, and can live in unheated aquaria at a temperature comfortable for humans. However, rapid changes in temperature (for example in an office building in winter when the heat is turned off at night) can kill them, especially if the tank is small. Care must also be taken when adding water, as the new water may be of a different temperature. Temperatures under about 10 °C (50 °F) are dangerous to fancy varieties, though commons and comets can survive slightly lower temperatures. Extremely high temperatures (over 30 °C (86 °F) can also harm goldfish. However, higher temperatures may help fight protozoan infestations by accelerating the parasite's life-cycle—thus eliminating it more quickly. The optimum temperature for goldfish is between 20 °C (68 °F) and 22 °C (72 °F). Like all fish, goldfish do not like to be petted. In fact, touching a goldfish can endanger its health, because it can cause the protective slime coat to be damaged or removed, exposing the fish’s skin to infection from bacteria or water-born parasites. However, goldfish respond to people by surfacing at feeding time, and can be trained or acclimated to taking pellets or flakes from human fingers. The reputation of goldfish dying quickly is often due to poor care. The lifespan of goldfish in captivity can extend beyond 10 years. If left in the dark for a period of time, goldfish gradually change colour until they are almost gray. Goldfish produce pigment in response to light, in a similar manner to how human skin becomes tanned in the sun. Fish have cells called chromatophores that produce pigments which reflect light, and give the fish colouration. The colour of a goldfish is determined by which pigments are in the cells, how many pigment molecules there are, and whether the pigment is grouped inside the cell or is spaced throughout the cytoplasm. Because goldfish eat live plants, their presence in a planted aquarium can be problematic. Only a few aquarium plant species for example Cryptocoryne and Anubias, can survive around goldfish, but they require special attention so that they are not uprooted. Plastic plants are more durable. Goldfish are popular pond fish, since they are small, inexpensive, colourful and very hardy. In an outdoor pond or water garden, they may even survive for brief periods if ice forms on the surface, as long as there is enough oxygen remaining in the water and the pond does not freeze solid. Common goldfish, London and Bristol shubunkins, jikin, wakin, comet and some hardier fantail goldfish can be kept in a pond all year round in temperate and subtropical climates. Moor, veiltail, oranda and lionhead can be kept safely in outdoor ponds year-round only in more tropical climates and only in summer elsewhere. Ponds small and large are fine in warmer areas (although it ought to be noted that goldfish can "overheat" in small volumes of water in summer in tropical climates). In frosty climes the depth should be at least 80 centimeters (31 in) to preclude freezing. During winter, goldfish become sluggish, stop eating and often stay on the bottom of the pond. This is normal; they become active again in the spring. Unless the pond is large enough to maintain its own ecosystem without interference from humans, a filter is important to clear waste and keep the pond clean. Plants are essential as they act as part of the filtration system, as well as a food source for the fish. Plants are further beneficial since they raise oxygen levels in the water. Compatible fish include rudd, tench, orfe and koi, but the latter require specialised care. Ramshorn snails are helpful by eating any algae that grows in the pond. Without some form of animal population control, goldfish ponds can easily become overstocked. Fish such as orfe consume goldfish eggs. Like some other popular aquarium fish, such as the guppy, goldfish and other carp are frequently added to stagnant bodies of water to reduce mosquito populations. They are used to prevent the spread of West Nile Virus, which relies on mosquitoes to migrate. However, introducing goldfish has often had negative consequences for local ecosystems. Fishbowls are detrimental to the health of goldfish and are prohibited by animal welfare legislation in several municipalities. 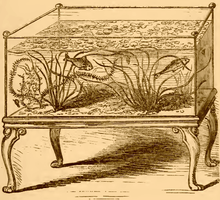 The practice of using bowls as permanent fish housing originated from a misunderstanding of Chinese "display" vessels: goldfish which were normally housed in ponds were, on occasion, temporarily displayed in smaller containers to be better admired by guests. Goldfish kept in bowls or "mini aquariums" suffer from death, disease, and stunting, due primarily to the low oxygen and very high ammonia/nitrite levels inherent in such an environment. In comparison to other common aquarium fish, goldfish have high oxygen needs and produce a large amount of waste; therefore they require a substantial volume of well-filtered water to thrive. In addition, all goldfish varieties have the potential to reach 5" (12.7 cm) in total length, with single-tailed breeds often exceeding a foot (30.5 cm). Single-tailed varieties include common and comet goldfish. In many countries, carnival and fair operators commonly give goldfish away in plastic bags as prizes. In late 2005 Rome banned the use of goldfish and other animals as carnival prizes. Rome has also banned the use of "goldfish bowls", on animal cruelty grounds, as well as Monza, Italy, in 2004. In the United Kingdom, the government proposed banning this practice as part of its Animal Welfare Bill, though this has since been amended to only prevent goldfish being given as prizes to unaccompanied minors. 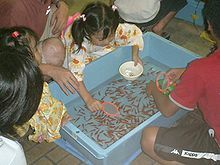 In Japan, during summer festivals and religious holidays (ennichi), a traditional game called goldfish scooping is played, in which a player scoops goldfish from a basin with a special scooper. Sometimes bouncy balls are substituted for goldfish. Although edible and closely related to some fairly widely eaten species, goldfish are rarely eaten. A fad among American college students for many years was swallowing goldfish as a stunt and as a fraternity initiation process. The first recorded instance was in 1939 at Harvard University. The practice gradually fell out of popularity over the course of several decades and is rarely practiced today. In Iran and among the international Iranian diaspora, goldfish are a traditional part of Nowruz celebrations. Some animal advocates have called for boycotts of goldfish purchases, citing industrial farming and low survival rates of the fish. ^ NatureServe (2016). "Carassius auratus ". IUCN Red List of Threatened Species. Version 2016.3. International Union for Conservation of Nature. Retrieved 14 April 2017. ^ "USGS-NAS, Non-indigenous Aquatic Species". Retrieved 2015-04-29. ^ "Carassius auratus (Linnaeus, 1758)". Fishbase. Retrieved 2015-04-29. ^ "Goldfish". Ocean Park. Retrieved 2009-11-16. ^ a b c d Roots, Clive (2007). Domestication. Westport: Greenwood Press. pp. 20–21. ISBN 978-0-313-33987-5. ^ a b c d e "Background information about goldfish". Bristol Aquarists' Society. Retrieved 2006-07-28. ^ Smartt, Joseph (2001). Goldfish varieties and genetics: A handbook for breeders. Oxford: Blackwell Science. p. 21. ISBN 978-0-85238-265-3. ^ "goldfish". Archived from the original on September 1, 2009. Retrieved 2013-02-28. ^ Brunner, Bernd (2003). The Ocean at Home. New York: Princeton Architectural Press. ISBN 978-1-56898-502-2. ^ Mulertt, Hugo (1883). The Goldfish And Its Systematic Culture With A View To Profit. Cincinnati [McDonald & Eick, print.] Retrieved 2009-07-07. ^ a b c "Giant goldfish 'simply amazing'". BBC News. 17 April 2008. Retrieved 17 July 2010. ^ "Surrey schoolboy catches 5lb goldfish in Dorset lake". BBC News. 15 July 2010. Retrieved 17 July 2010. ^ Neumeyer, Christa (1988). Das Farbensehen des Goldfisches: Eine verhaltensphysiologische Analyse. G. Thieme. ISBN 978-3137187011. ^ Ladich, F., & Fay, R. R. (2013). Auditory evoked potential audiometry in fish. Reviews in Fish Biology and Fisheries, 23(3), 317-364. ^ FAY, R. R., & POPPER, A. N. (1974). Acoustic stimulation of the ear of the goldfish (Carassius auratus). Journal of Experimental Biology, 61(1), 243-260. ^ Research by the School of Psychology at the University of Plymouth in 1994. Goldfish were trained to push a lever to earn a food reward; when the lever was fixed to work only for an hour a day, the fish soon learned to activate it at the correct time. See: Gee, P; Stephenson, D; Wright, DE (July 1994). "Temporal discrimination learning of operant feeding in goldfish". Journal of the Experimental Analysis of Behavior. 62 (1): 1–13. doi:10.1901/jeab.1994.62-1. PMC 1334363. PMID 16812735. ^ Demonstrated in a 1994 public experiment at the Palais de la Découverte science museum. The experimental details and results are described in: "Poissons rouges: la mémoire dans l'eau". Revue du Palais de la Découverte. 217. April 1994. ^ "Send Your Fish to School". ABC News. May 7, 2008. Retrieved December 28, 2012. ^ Loh, Richmond. "Goldfish (Carassius auratus)" (PDF). The Fish Vet.com. Retrieved December 31, 2013. ^ ""What is a Lionchu?" by Peter Ponzio, an article from the Goldfish Pages Website (Goldfish Society of America), date retrieved: 28 February 2013" (PDF). ^ ""GFSA - Ask the Judges", an article about the Lionchu by Larry Christensen, Peter Ponzio, Scott Taylor, Tony Reynolds and John Parker, from the Goldfish Pages Website (Goldfish Society of America), date retrieved: 28 February 2013" (PDF). ^ "Nutrafin Aquatic News, Issue #4, 2004, Rolf C. Hagen, Inc. (USA) and Rolf C. Hagen Corp. (Montreal, Canada)". Hagen.com. Retrieved 2011-11-19. ^ Komiyama, Tomoyoshi; Hiroyuki Kobayashi; Yoshio Tateno; Hidetoshi Inoko; Takashi Gojobori; Kazuho Ikeo (February 2009). "An evolutionary origin and selection process of goldfish". Gene. 430 (1–2): 5–11. doi:10.1016/j.gene.2008.10.019. PMID 19027055. Retrieved 2010-08-09. ^ Les Pearce. "Common Gold Fish". Aquarticles. Archived from the original on 28 May 2006. Retrieved 20 June 2006. ^ "Goldfish". Mypets.net.au. Retrieved 2011-11-19. ^ "Goldfish". Experiencefestival.com. Archived from the original on 2011-12-12. Retrieved 2011-11-19. ^ "Goldfish has brain operation". BBC News. 2014-09-15. ^ William L. Arnold; William L. Anderson (2001). Biotechnology Deskbook. Environmental Law Institute. p. 154. ISBN 978-1-58576-029-9. ^ a b Knight, Sam (2005-10-26). "Rome bans goldfish bowls, orders dog owners on walks – World – Times Online". The Times. London. Retrieved 2006-07-21. ^ a b "Council bans goldfish bowls". ABC Australian Broadcast Corporation. 2004-07-23. Retrieved 2015-04-21. ^ "5 reasons not to use goldfish bowls". Goldfish Care Guide. 2008-03-05. Retrieved 2009-02-01. ^ "Defra, UK – Animal Health and Welfare – Animal Welfare – Animal Welfare Bill". Archived from the original on 2006-08-20. Retrieved 2006-07-21. ^ "Swallowing Goldfish". Archived from the original on 2006-06-18. Retrieved 2006-07-21. ^ Laylin, Tafline. "5 Million Goldfish Die for Nowruz – the Iranian New Year". Green Prophet. ^ "Iran: A Nowruz New Year Without Goldfish? · Global Voices". 16 March 2012. Wikimedia Commons has media related to Carassius auratus. "Carassius auratus". Integrated Taxonomic Information System. Retrieved 5 October 2004. Froese, Rainer, and Daniel Pauly, eds. (2004). Carassius auratus auratus in FishBase. September 2004 version. This page was last edited on 31 March 2019, at 11:13 (UTC).